Happy Thursday Team Stryker fans! This is one of my favorite pages of Team Stryker so far and for many reasons: 1. It has a T-rex 2. Eagleheart gets to yell “EAGLE PUNCH!” and 3. Eagleheart thinks he can out “RAWR” a T-rex. 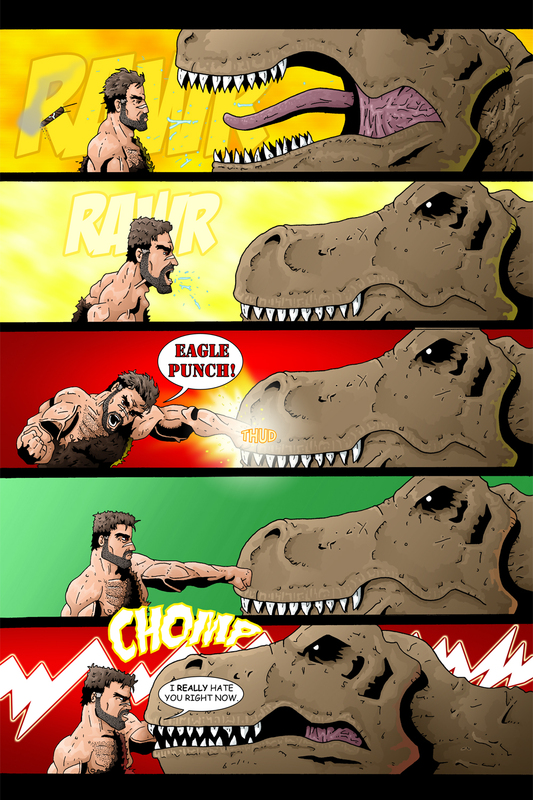 I don’t know about you but I’m pretty sure that this wouldn’t be my first instinct if a T-rex screamed in my face. I would probably go with the Austin Powers plan: soil myself and come up with a new plan. It’s always a challenge when you have to do multiple panels from the same camera angle as you want to make sure that your characters are the same size and drawn at the same angle each time. The more panels you have the more complicated it gets. It was a fun drawing challenge and I will for sure find a way to bring back all the dinosaurs in the future. Just a quick reminder that next Monday’s update will be my last one with new pages from Mission 003 before the holidays. I’ll be returning back on January 3rd with new pages but the site will still be updated with either pages from my sketch book or the pencils and inks from previous pages from the last 3 issues. If you have a request of something you would like to see let me know in the comments section or find me on Facebook and Twitter. Have a great weekend and I’ll see you all back here for another exciting page of Team Stryker!